METER THEON (Mother of the Gods) was a title of the Greek goddess Rheia and the Phrygian Kybele (Cybele). She often appears in myth as an amalgam of the two goddesses, especially in stories connected with the Great Mother of Samothrake, of Mount Ida in the Troad, Mount Dindymene in Bithynia and Mount Sipylos of Lydia--regions spanning the Phrygian and the Greek world. 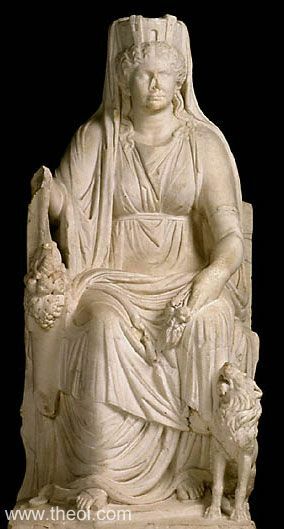 To further confound matters, the Meter Theon of Samothrake was often identified with Demeter and the Great Mother of Mount Ida in the Troad with Aphrodite. The stories of their romances with Iasion and Ankhises respectively, echo the older Phrygian tale of Attis and Kybele. Myths unique to the Greek Rhea and the Phrygian Kybele are described on two seperate pages. King Tantalos of Lydia killed his son Pelops and served him up at a feast of the gods. Rhea and the Moirai (Fates) intervened, restoring the boy to life. Mount Sipylos was a major cult centre of the Meter Theon in Lydia, so it is not surprising she should play a role in the myth. "‘When Klotho (Clotho) took Pelops from the pure cauldron’ Bacchylides says that it was Rhea who restored Pelops by lowering him again into the cauldron." Near the weeping Rock of Niobe--sister of the Pelops described above--on Lydian Mount Sipylos stood another rock, the metamorphosed form of Pyrrhos, a man who had tried to assault the Meter Theon. "Near her [the rock of Niobe on Mount Sipylos in Lydia] shall be Pyrrhos, a Phrygian stone enamoured, still feeling the lawless lust for impossible union with Rheia [i.e. Pyrrhos attempted to assault Rheia and was turned to stone]." The Meter Theon was identified with the goddess Demeter on the island of Samothrake. The story of the Samothrakian Demeter and Iasion were, however, derived from that of Anatolian Kybele and her consort Attis. "This wedding of Kadmos (Cadmus) and Harmonia was the first, we are told, for which the gods provided the marriage-feast . . . and Elektra (Electra) [presented as a wedding gift] the sacred rites of the Megale Meter Theon (Great Mother of the Gods), as she is called, together with cymbals and kettledrums and the instruments of the ritual . . .
Iasion married Kybele (Cybele) and begat Korybas (Corybas). And after Iasion had been removed into the circle of the gods, Dardanos and Kybele and Korybas conveyed to Asia the sacred rites of the Meter Theon (Mother of the Gods) and removed with them to Phrygia. Thereupon Kybele, joining herself to the first Olympos [mountain god], begat Alke (Alce) and called the goddess Kybele after herself; and Korybas gave the name of Korybantes (Corybantes) to all who, in celebrating the rites of his mother, acted like men possessed." "Melanippides says that Demeter and the Meter Theon (Mother of the Gods) are one and the same." Apollonius Rhodius describes the initiation of the Argonauts into the mysteries of the Meter Theon on the island of Samothrake and their subsequent founding of her cult on the Bithynian Mount Dindymene. As a reward for their service she provided them with a favourable sailing breeze. In a second version of the Argonaut myth, the heroes are not described introducing the cult of the goddess to Mount Dindymene but merely partaking in the rites practised there. They were driven by the goddess to punish the blasphemous Bithynian king Kyzikos. "Cyzicus [a Mysian King] upon his swift horse shook [Mount] Dindymus where votaries revel with bloodstained arms [in the worship of the Meter Theon], and wearied the woods, he was betrayed by his too great love of the chase; for with his javelin he slew a lion that was wont to bear its mistress [the Meter Theon] through the cities of Phrygia and was now returning to the bridle. And now (madman!) hath he hung from his doorposts the mane and the head of his victim, a spoil to bring sorrow to himself and shame upon the goddess. But she, nursing her great rage, beholds from the cymbal-clashing mountain the ship [of the Argonauts] with its border of kingly shields, and devises against the hero deaths and horrors unheard of: how in the night to set allied hands at strife in unnatural war, how to enmesh the city in cruel terror [the Argonauts killed Kyzikos and his men at night in a confused battle]." The Meter Idaia (Mother Goddess of Mount Ida) wazs loved by the Dardanian prince Ankhises in a local version of the Kybele-Attis myth. The Greeks identified the Mother in this particular myth--and in the Trojan War saga in general--with the goddess Aphrodite. In this myth the Idaian Mother rescues the wife of Aeneas (her daughter-in-law) from Troy. Here the Meter Theon is identified with both Rhea and Aphrodite who are described acting in tandem. “About Kreusa (Creusa) the story is told that the Meter Theon (Mother of the Gods) and Aphrodite rescued her from slavery among the Greeks, as she was, of course, the wife of Aeneas." When Aeneas landed in Italy, a local warlord Turnus set his ships ablaze. The Idaian Mother intervened by transforming the vessels into sea-nymphs for the hulls had been crafted from trees felled on her holy mountain. "Turnus [of the Rutuli of Italy] had sent his firebrands to consume the pine-framed vessels [of Aeneas' fleet]; ships the waves had spared feared flames. And now the conflagration burnt caulking and pitch and all the food of fire, climbing the mast-head, spreading to the sails; the benches smoked across the curving hulls. And then the holy Mother of the Gods (Genetrix Sanctum Deum) remembering that on Ida's peaks those pines were felled, made clashing cymbals fill the air and shrilling fifes, and, borne along the breeze by her tame lion-team, ‘In vain,’ she cried, ‘Turnus, your godless hands are flinging fire. I'll rescue them! Never shall I allow flames to consume my forest's life and limb.’ It thundered as she spoke and hard upon the thunder crushing squalls of leaping hail came crashing down and all the brother Astraei (Winds), battling in sudden shock and strife, convulsed the skies and surging seas. And one wind's strength the fostering Mother called in aid to break the hempen hawsers of the Trojan fleet, and on their beam ends drove the ships to sea and sank them. Timbers softened and the wood was changed to flesh; the curved prows turned to heads, the oars to toes and swimming legs; the sides remained as sides; the keel that underlay the centre of the ship became a spine, the rigging soft sleek hair, the yards were arms the colour sea-blue still; and in the waves they used to fear they play their girlish games, Naides Aequorae (Sea-Nymphs), born on the granite hills, now natives of the soft sea-deeps, untouched by memories of their birthplace." At once each vessel snapped the moorings that held her stern to the bank, and all, burying their beaks in the water, plunged deep down like dolphins. Soon they surfaced again, but--wonder of wonders--each was a maiden now as they coursed over the sea--each ship that had been lying, bronze-beaked, along the shore." The cult of the Meter Theon was introduced to Boiotia from Samothrake. In this region she was usually identified with Rhea but sometimes also with the goddess Aphrodite. In the myth of the transformation of Hippomenes and Atalanta into lions, the two goddesses act in tandem as an avenging agent. "Did I [Venus-Aphrodite] not deserve especial thanks and incense in my honour [from Hippomenes for her assitance in winning Atalanta for his bride]? But he forgot; he gave no thanks and burnt no incense; then to sudden wrath I turned. Stung by his scorn and lest I be despised in days to come, I set my heart against them both, to warn the world by their example. A temple stands hidden in shady woods, which once Echion [one of the Spartoi of Thebes] to fulfil a vow had raised to the great Mater Deum (Mother of the Gods) [Rhea]. There they had journeyed and were glad to rest; and there ill-timed importunate desire, roused by my power, possessed Hippomenes. Beside the temple was a dim-lit grotto, a gloomy cavern, roofed with natural rock, an ancient holy shrine, filled by the priest with wooden statues of the gods of old. He entered here and with forbidden sin defiled the sanctuary. The holy statues turned their shocked eyes away and the Mater Turrita (tower-crowned Mother) [Rhea] pondered should she plunge the guilty pair beneath the waves of Stygia. Such punishment seemed light. Therefore their necks, so smooth before, she clothed with tawny manes, their fingers curved to claws; their arms were changed to legs; their chests swelled with new weight; with tails they swept the sandy ground; and in their eyes cruel anger blazed and growls they gave for speech. Their marriage-bed is now a woodland lair, and feared by men, but by the goddess tamed, they champ--two lions--the bits of Cybele [Rhea]." Some poets describe the gods of Olympos attending the orgiastic feasts of Dionysos and the Meter Theon. "Wise are they that know what manner of festival of Bromios [Dionysos] the Ouranidai (Gods of Heaven) hold in their halls, hard by the sceptre of Zeus. In the adorable presence of the mighty Meter Theon (Mother of the Gods), the prelude is the whirling of timbrels; there is also the ringing of rattles, and the torch that blazeth beneath the glowing pine-trees. There, too, are the loudly sounding laments of the Naides (Naiads), and there the frenzied shouts of dancers are aroused, with the thong that tosseth the neck on high; there too hath been brandished the almighty fire-breathing thunderbolt of Zeus, and the spear of Enyalios [Ares], while the war-like aegis of Pallas [Athena] resoundeth with the hissings of countless serpents. Meanwhile, lightly cometh the lone huntress Artemis, who in Bacchic revels hath yoked the brood of savage lions for Bromios [Dionysos], who is enchanted even by the dancing herds of wild beasts." Ovid has the gods attend a feast of the Meter THeon on Mount Ida in the Troad where the lustful Mysian god Priapos attempts to violate the virgin Hestia. "Coroneted Cybele [Rhea], with her crown of turrets, invites the eternal gods to her feast. She invites, too, Satyri (Satyrs) and Nymphae (Nymphs), Rural-Spirits (Rustica Numina); Silenus is present, uninvited. It's not allowed and too long to narrate the gods' banquet: night was consumed with much wine. Some blindly stroll shadowy Ida's dells, or lie down and rest their bodies in the soft grass. Others play or are clasped by sleep; or link their arms and thump the green earth in triple quick step." "I prithee, clear-voiced Mousa, daughter of mighty Zeus, sing of the Meter (Mother) of all gods and men (panton te theon panton t' anthropon). She is well-pleased with the sound of rattles and of timbrels, with the voice of flutes and the outcry of wolves and bright-eyes lions, with echoing hills and wooded coombes. And so hail to you in my song and to all goddesses as well!" "To Rhea, Fumigation from Aromatics. Illustrious Rhea, to my prayer incline, daughter of various-formed Protogonos divine, who drivest thy sacred car with speed along, drawn by fierce lions, terrible and strong. Mother of Zeus, whose mighty arm can wield the avenging bolt and shake the dreaded shield. Brass-sounding, honoured, Kronos' blessed queen, drum-beating, fury-loving, of a splendid mien. Thou joyest in mountains and tumultuous fight, and mankind's horrid howlings thee delight. War's parent, mighty, of majestic frame, deceitful saviour, liberating dame. Mother of Gods and Men, who from Gaia (Earth) and spacious Ouranos (Heaven) derives her glorious birth. The ethereal gales, the deeply spreading sea, Goddess, aerial-formed, proceed from thee. Come, pleased with wanderings, blessed and divine, with peace attended on our labours shine; bring rich abundance; and, wherever found, drive dire disease to earth's remotest bound." "To Meter Theon (the Mother of the Gods), Fumigation from a variety of Odoriferous Substances. Meter Theon (Mother of the Gods), great nurse of all, draw near, divinely honoured, and regard my prayer. Throned on a car, by lions drawn along, by bull-destroying lions, swift and strong, thou swayest the sceptre of the pole divine, and the world's middle seat, much famed, is thine. Hence earth is thine, and needy mortals share their constant food, from thy protecting care. From thee at first both Gods and men arose; for thee the sea and every river flows. Hestia and source of wealth thy name we find to mortal men rejoicing to be kind; for every good to give thy soul delights. Come, mighty power, propitious to our rites, all-taming, blessed, Phrygian Saviour, come, Kronos' (Cronus') great queen, rejoicing in the drum." "But now I wish to voice a prayer to the Meter (Mother), the revered goddess to whom, and to great Pan young maids before my door at nightfall often sing their praise." "The Aiolian [of Aiolia in Anatolia], glorious goddess, Mater Panton (Mother of All)." "If one could fall at queenly knees, black-leaf-robed, of the Mater Oreias (Mountain Mother) and casting one's beautiful arms about them might pray, ‘Gold-tressed Mater Theon (Mother of the Gods), save, I beseech you, my life, yes mine, for which refuge is hard to find.’"